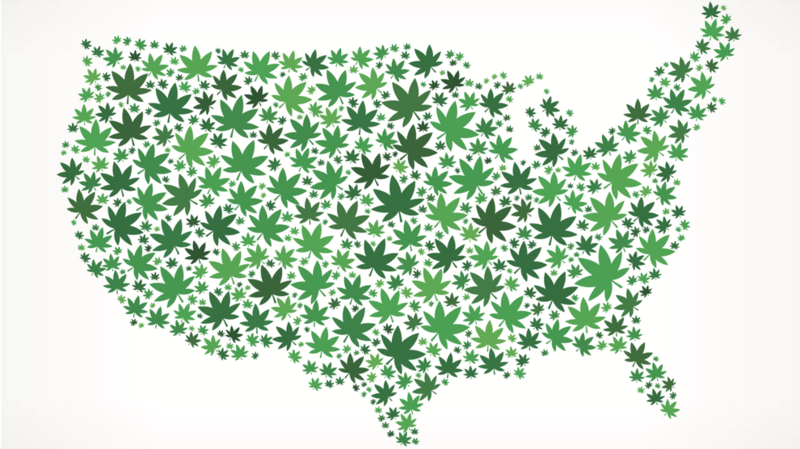 As more states continue to legalize marijuana, the conversation of federal legalization continues to grow and has never been more relevant than right now. Pundits already refer to 2019 as marijuana biggest year yet and by the looks of it – they are not wrong. 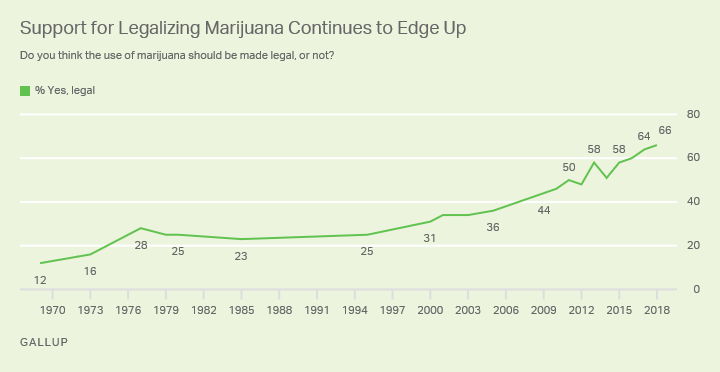 The build up has been consistent and in 2018 a record high of 66% of Americans came out in support of legalizing marijuana, via Gallup survey. The figure marks the third consecutive year that support on the measure has increased. It’s not just the American people. Major corporations like Altria (Marlboro cigarettes) and Constellation (Corona beer, Svedka vodka) made multi-billion dollar investments in 2018. Martha Stewart is launching her own line of CBD products with Canopy Growth. Even the U.S. senate included hemp legalization in the 2018 Farm Bill – legalizing every part of the cannabis plant except THC. The tide isn’t turning, it already turned – now we need to deal with the logistics. It is clear that the conversation, attitudes and perceptions of marijuana, CBD and hemp based products is evolving nationwide and federal legalization is imminent, whether it will be in 2019, 2020 or further delayed – it is inevitable. The wine and spirits industry are heavily invested in this evolution due to natural comparisons, synergies and competitive consumption, and the industry and its leading organizations and private companies have an opportunity to influence, consult and help implement thoughtful legislation. The importance of clearly defining and determining the scope of federal legislation cannot be understated and the responsible limitation of possession, sale, consumption, driving while under the influence etc. is paramount. What does seem to be falling behind in the conversation is the current and historic significance of marijuana related arrests and who is set to profit from legalization. According to the FBI in August of 2018, there is an increase in marijuana related arrests that sees well over half a million people arrested every year – that’s roughly one arrest every 48 seconds. It should come as no surprise who is currently, and historically, disproportionally impacted by marijuana arrests: people of color. Federal legislation needs to address this issue that has long plagued, disrupted and devastated black and brown communities. As marijuana continues to be decriminalized across the country, what does that mean for those convicted and currently serving time for marijuana related sentences? Better yet, now that recreational marijuana is on track to become a multi-billion dollar industry, who will reap the benefits? Thankfully for federal legislators, black lawmakers in N.Y. are setting the tone and refuse to pass any legalization that perpetuates racial inequality fostered under current drug laws and does nothing to appropriately share the potential profits with those who have suffered most from the criminalization of marijuana. Remarkably, none of the 10 states or Washington D.C. that have legalized recreational marijuana ensured that minority communities would share in any economic windfall of legalization – missing out on an opportunity to redress years of having a disproportionate number of African-Americans arrested on marijuana charges. N.J. Senator and presidential candidate Cory Booker seems to be one of few aligned with N.Y. lawmakers (and tentatively Governor Cuomo, to be proven). His bill to legalize marijuana nationwide includes “community reinvestment provisions like job training for areas hardest hit by the failed drug war.” Although that certainly stokes hope for this issue being handled with care, private companies intending to participate in the marijuana economy cannot rely solely on the hard work of a small group of lawmakers. The wine and spirits industry has a real opportunity to throw its weight behind fair, corrective and empowering legislation by supporting initiatives and bills that address these far-reaching issues rather than ignore them. That should be the focus and those who realize that are best suited to become reliable and respected suppliers of legal marijuana – the market demands it and the market is watching these key stakeholders very closely. The bud is in your court – make it count.